When you begin to understand the potential for the Internet of Things (IoT), you view the world a little differently. You find applications that could be drastically improved. One area that I’m shocked that hasn’t caught up yet is the elevator. 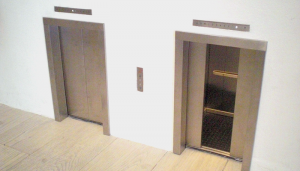 If you live or work in building, the process in getting to your floor hasn’t changed much since the introduction of the elevator. While the technology around creating safer elevators has drastically improved. Thankfully I’m not the only one thinking about it. Time featured a story in Oct. 2015 called “A Big Change Is Coming to Elevators, And It Matters More Than You Think,” which reads like a promotion for ThyssenKrupp’s MAX technology that links elevators to Microsoft’s Azure cloud and toots about efficiency for building operators. An even smarter application might be able to recognize a visually impaired person with a white cane, a person with crutches, a walker or a wheelchair and enhance that rider’s experience by allowing for a few extra seconds to exit the elevator. As a former Bostonian, I grew up with the ideas of “four corners,” where the first four people to enter an elevator find a respective corner and “own it.” Yet, elevator buttons are in one of those corners. A smart elevator might simply ask passengers, “Floor, please?” With passengers entering from other floors, it would simply ask again. A panel might show which floors have already been selected. Sounds like Star Trek right? It is. And Star Trek first aired in 1964. This smart elevator isn’t a new concept. Smart Elevators might also want to employ well-used and off-the-shelf camera technology to serve a variety of needs. For instance, facial recognition software might unlock floors that require certain approval instead of the leaning through an elevator crowd to swipe an access code. Such an application could also help those facing medical emergencies since there are far too many conditions where a person is unable to hit the Help or Alert button. A Smart Elevator might have an application where it sees a person on the floor of the elevator, connects that person with a 911 service as well as property staff to not only get help but bring that person to a floor where they could receive more immediate attention. With situations such as heart attacks, seconds are crucial and smarter elevators really could save lives. Smart elevators could also be used for safety as well. During fire drills, when people are asked to take the stairs, elevators could be programmed to quickly return to their base floor for safety. And while it would take some approval, a smart elevator might remember floors where passengers with mobility issues are located and remain open for those people to get them to safety if they can’t use the stairs. Such features should not require new elevators since the cost would far too prohibited. Upgrading existing elevators would still incur some expense but the benefits would help increase efficiency, safety and convenience. Finally, smart elevators could easily end “elevator music” with something as simple as nature sounds, daily building activity updates, breaking news or a variety of different versions of radio-friendly music. He, looking down at his iPhone 5S, had a point. More often then not he’s not using it to call anyone. He plays games, texts, surfs the web and plays music. Not typical functions of a standard telephony device but a modern, very nimble communications device that merges together many functions in a small and powerful device. Which got me to thinking, if our smartphones aren’t really phones any longer, what should we really call them? And from a marketing perspective, how would you reclassify billions of devices with a completely new term based on the functions we use “smartphones” for every day? Oddly, as an old school tech guy, my first “smartphone”-like devices were Personal Digital Assistants, devices that replaced notepads, to do lists and some gaming functions. PDAs replaced paper. Yet, the iPhone was the first successful mainstream volley into something different and a stroke of marketing genius. Combine the popular iPod music player with a multipurpose communication device tied to a massive distribution backbone and see what happens. It worked amazingly well. 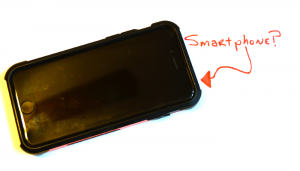 The smartphone replaced more than paper or PDAs, it replaced many different devices and tools. We use our smartphones less and less for voice communications as VOIP services take over. So much so that even cell phone companies are having difficulty in keeping up with product demand for GBs per month and how to charge for text messages (which should be free). Rebranding them isn’t easy. It needs to be short, Tweetable, SMS-able and simple. My suggestion would use a term we use every day and grow it. It needs to be all encompassing and roll up all the many things that we do on our devices. At the end of the day, we no longer just use our smartphones to talk, we use them to communicate in a variety of ways. A Comm is one less letter than phone and six less than smartphone (alas, tweetable). And given that most of the commercial websites that we focus on every day use .com, a variation wouldn’t be hard to market. Yet, Comms aren’t just for commerce, they would stand for Community, a way to use apps and networks to create communities of individuals that create new ways to interact and communicate. And it can be Common, a way to think less about walled-in networks and build smarter, more adaptable communities through a list of common APIs, platforms and applications. Our smartphones really aren’t phones anymore, they’re Comms, devices that allow people to communicate in traditional, novel and new ways. And while paper, emails and text messages continue, Comms remove the analog behaviors of the past and finally embrace a fully digital today. Replaced by hard drives, cloud, interconnectivity and evolving ways to communicate.